Our development timeline through version 0.4.2 is solid. We’re fullfilling our #1 feature request (can you guess what is is?) and refactoring the core of how component and containers work together. We have supported multi-tenancy systems since the beginning, but components had a 1-to-1 relationship with containers. Soon you will have the ability to place a single component into multiple containers. This is a critical step that we must accomplish before continuing to increase functionality. When we launched in August there were browser compatibility issues, a limited feature set and no friendly wizard to help get your status page set up. But that has all changed! As of today, our platform has never been more stable. Instead of debugging errors, we are enhancing the existing features and adding new ones. Create private status pages for internal use. Robots care about your status too! 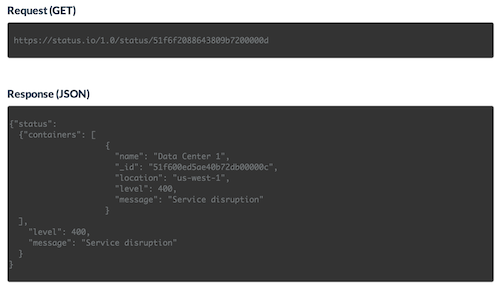 Every status page comes with a unique API call that provides your current system status. Enable your entire team to post status updates and manage your status page.